Two very different yachts have arrived in Thailand to undertake refit work with Yacht Solutions before going on their separate ways. 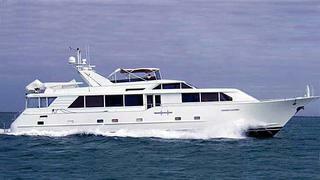 Captain Brett Sussman arrived in Thailand with Escape, a 30 metre Broward earlier this year. This yacht came from America to undertake some refit work with Yacht Solutions and is planning on staying in Asia, basing itself in Phuket. Work on Escape includes; a complete interior refit, exterior paint work, anti-fouling, various engineering tasks and exterior beautification. The other yacht is the gorgeous Merrymaid, a 1905 Camper and Nicolson 30 metre classic sailing yacht that arrived from Hong Kong and docked in Bangkok Dock, Bangkok, to begin a three-month refit. This famous classic sailing yacht is circumnavigating the globe and this is her first time in Thailand. Captain Les Dunn chose Yacht Solutions as he was 'looking for a yard with access for a 3.8m draft closest to Hong Kong with experience and expertise'. Work on Merrymaid includes, complete hull re-paint, anti-fouling, exterior varnish work, interior painting, engine and generator servicing, prop and shaft servicing and various other engineering tasks. From Bangkok she is scheduled to resume her round-the-world voyage, arriving in Cape Town in June 2013.